Mandolfie Mr. Chrystal. His both grand sires are well know TOP sires of England Ch. Brystaff Simply the Best and Ch. Boldmore Finbar Furey. Heri sire is Crufts Winner 2000 and GB Ch. Kannechor Young Hustler. Teffi has a very stabile temper. 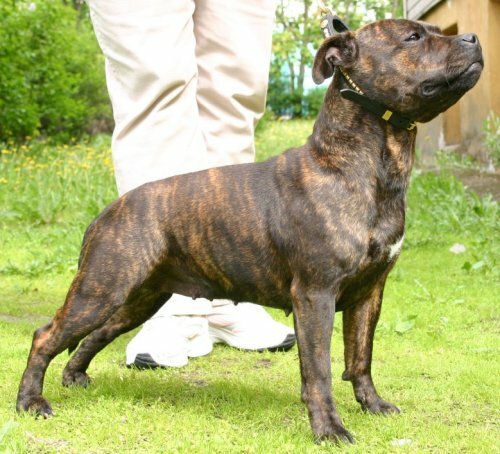 Her well developed substantial body is very compact shaped and shows a beautiful top-line. Her angulations, both rear and front, are excellent. She shows a beautiful head with correct scissor bite. Teffi have well developed chest with straight legs and excellent bones with cat feet. In her short showqarrier Teffi had won a lot. She has been once puppy BIS-III place, three times BIS- II and twice BIS-I. In intermedia class Teffi become soon Russian and Russian Federation Champion, she got also Cacib and has won Terrier Group first and third place. After coming to us, Teffi become in very short time Latvian and Estonian Champion. Teffi is a mother of our lovely young girl Mathilda. Since March 2006 Teffi is owned & loved and perfectly handled by Svetlana.